Obscurity of the Day: Oh, That New York! What It Doesn't Do To You! Herb Roth is best known for his book and magazine cartoons, as well as being the assistant/ghost to H.T. Webster. Here, though, is an early work in comic strip form. In fact, it's the only continuing comic strip that I have been able to document by this otherwise very prolific artist. Roth obviously wasn't trying to conserve printer's ink when he came up with the title Oh, That New York! What It Doesn't Do To You!, and yes, every episode bore that rather ungainly title. The strip appeared on the second page of the New York World's Sunday Metropolitan section (we'd call it an arts and entertainment section these days) from January 12 through March 23 1913. The title was the only ungainly thing about this strip. The art, sort of an art deco meets cubist meets naive style that Roth used to good effect for years, was already in full flower, a real delight to behold. Startlingly modern for newspaper art in 1912, it apparently seemed so sophisticated to the World's editors that it deserved a special place of honor in a section otherwise illustrated with glamorous photos of Broadway stars and reproductions of great artworks. The strip chronicled the travails of those who visited or moved to the Big Apple. Roth, like most New Yorkers, seemed to revel in the unhealthy conditions, high prices, crime and assorted other blights of New York, essentially daring visitors to make it 'like us' in the big city. In Roth's comic strip none are successful, always hightailing it out of town at the end of the strip. New Yorkers were and still are a special breed, button-busting proud of the city that they proudly proclaim is a hellhole worse than the prison of Calcutta. In response I say to New Yorkers, "have you visited Gary Indiana lately?" 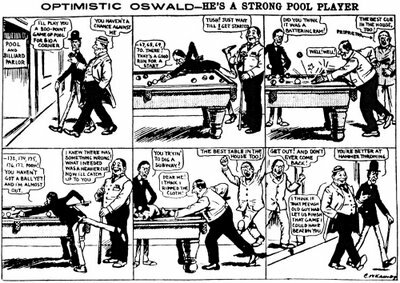 Perennial and prolific comic stripper Charles W. Kahles produced Optimistic Oswald for the New York World just a handful of times from 11/4 to 12/5/1912. The strip may well have been intended as a Sunday feature - the panel layout and size of the caption text seems more suited to larger Sunday reproduction. However, it was one of the few features that ran in the morning edition of the daily World (as opposed to the evening editions which were chock full of cartoon treasures). The premise is as standard as it comes for the era. Give your lead character one standout trait, in this case naive optimism, name the strip after the trait, and fire away. Strips with such simplistic premises as these had limited lifespans, but that was an accepted mode in those days, and helped to fuel the fierce creativity that was rampant on the daily comics pages. Sure there were lots of clinkers in the load, but there was also the occasional gold nugget among the coal. 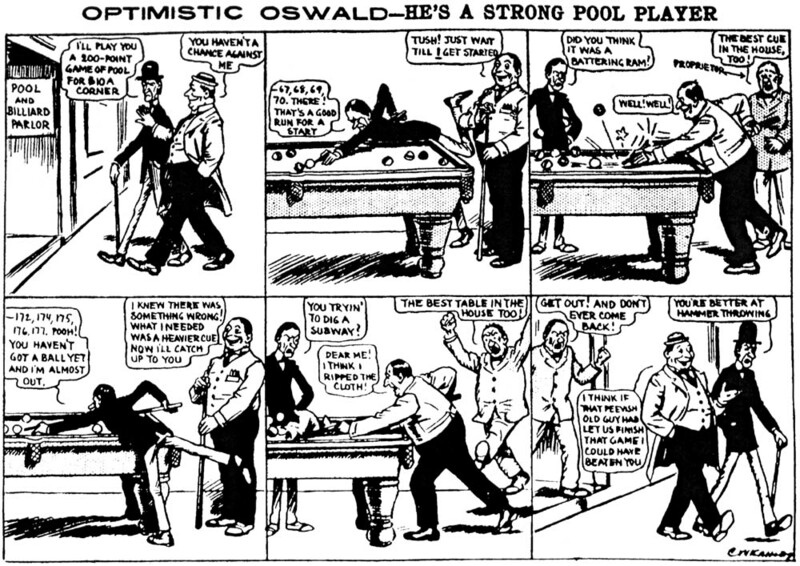 Optimistic Oswald is decidedly of the carboniferous variety. Yesterday's post on The Nut Brothers was apparently swallowed by Blogger, never to be seen. So you've missed out on the fascinating and informative essay that I slaved over. Today you get sloppy seconds. Boiled down, what we have here is the original daily version of The Nut Brothers, which later was revived as the perennial topper to Our Boarding House. Gene Ahern started this early version on 12/19/1921, then handed it off to Edgar Martin sometime in 1922. The two-panel Nut Brothers stacks ended 10/14/1922. The Sunday topper version of Nut Bros. ran 1931-65. We discussed the Chicago Tribune Comic Book in this blog entry; here's another of the new strips that was created especially for it. Mister Ex was a secret agent, forever embroiled in international intrigue of all sorts. His gimmick, that he was a master of disguise, seldom figured into the plotlines in any significant way. Bert Whitman was the creator of the strip, after having failed to get off the ground with a Green Hornet strip (which yours truly is still trying to determine if it ever actually made it into a paper). 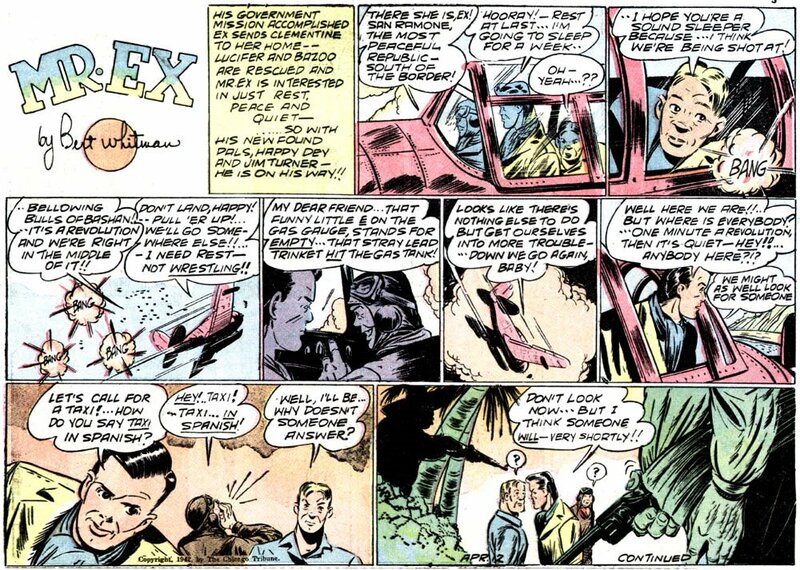 Mr. Ex started in the Trib's comic book on January 19 1941 and ran until the end of that special section on April 4 1943. The strip was one of the few that survived, and it was graduated to the regular comic section. This reprieve, however, was short-lived. The strip ended in the Trib on July 4. But that's not quite the end of the story. In the final panel of that July 4 Sunday it was announced that the strip would continue, renamed The Whizzer. However, the next Sunday no whizzing was to be found in the Trib's comic section. It wasn't until September 5 that a strip bearing that name appeared. The renamed strip only ran once more, on September 26, before it disappeared for good. Question is, did The Whizzer appear on a regular basis elsewhere? All I can say is that I haven't found it anywhere. Anyone? What's odd is that this Sunday comic strip was copyrighted to Judge Inc. (the noted political humor magazine), and the verse was written, at least initially, by Robert D. Towne, the editor of the magazine. Now anyone who has read Judge would agree that it did not cater at all to juvenile audiences, so I don't really see why they would have been producing and distributing this sort of strip. I've read a few episodes of the strip, thinking that maybe the teddy bears are a commentary on Roosevelt, but I see no undercurrent of political opinion. Anyway, the strip seems to have been distributed by the North American Company (syndication arm of the Philadelphia North American), and the strip was very well-drawn by J.R. Bray, later to make a name for himself in the animation game. Robert Towne wrote the verses until March 1 1908, then Constance Johnson took over the duties for the remainder of the run. The strip either wasn't marketed all that well, or the subject matter didn't appeal, because you won't find this strip running in very many papers. On the other hand, until the 1910s it was a bit unusual for papers to mix strips between different syndicates in their comic sections. Most just bought the standard 4 pages of material from one source and didn't put any brain juice into picking and choosing the best individual strips. So an oddball strip like this, sold as a special item to take over the front page of a paper's comic section from the regular fodder probably caught a lot of editoors wondering, "Why bother?" Nice blog, I didn’t know of it. Though, it is what I was looking for. A case of serendipity. I’ m Italian, I am very fond of comic strip and dream to become a scholar like you in this matter. I write some review about classic comic strips having a look on the Italian scene too. You can find them on www.lastriscia.net, a site where you may see some Italian comic strip from a group of authors I collaborate with. Together with a friend of mine, Giuseppe Scapigliati, a skilled cartoonist but also a great collector of original comic strips (perhaps you have heard of him), I am thinking of a blog like yours dedicated to comic strips. Obviously, for Italian readers. May we count on your help? You are on my bookmarks, all my compliments. I beg your pardon for my poor English. Always room for one more in the blogosphere! Please let us know when you start your comics blog and I'm sure we'll all come over to take a gander. Hello, Allan---LITTLE JOHNNY AND THE TEDDY BEARS originally was the feature on the back page of Judge magazine. In 1909 Judge launched their own short-lived comic syndicate,reprinting their old strips, mostly with recurring characters like James Montgomery Flagg's NERVY NAT and C.W. Kahles' THE YARNS OF CAPTAIN FIBB. Bray was there again, only with a new feature, LITTLE JOHNNY AND THE TAFFY POSSUMS. ("Billy Possum" was the long-forgotton William Howard Taft equivillant of the Theodore Roosevelt "Teddy Bear") It looks like Judge only syndicated four half-page strips a week.---Cole Johnson. I've never seen Kahles' Yarns of Captain Fibb or Bray's Taffy Possums in newspapers - where did you find them? I have three of these cartoons that i purchased at an estate sale - would you know their worth? They are in plastic with cardboard for stability and in great condition! Thanks! Best of luck to anyone trying to track the career of Camillus Kessler. Here was a guy who was all over the map, usually treading with little cat feet that leave little mark. Kessler first pops onto the radar doing a few short-run comics in St. Louis in 1904-06. He then goes on to do editorial cartooning for the St. Louis Times for some period (I can only vouch for 1911, but my files are scanty, as they are for all of Kessler's output). Kessler hit the big time (or semi-big time, anyway) when he got his start at the New York Press in 1914 during that paper's short-lived bid to become a major player. 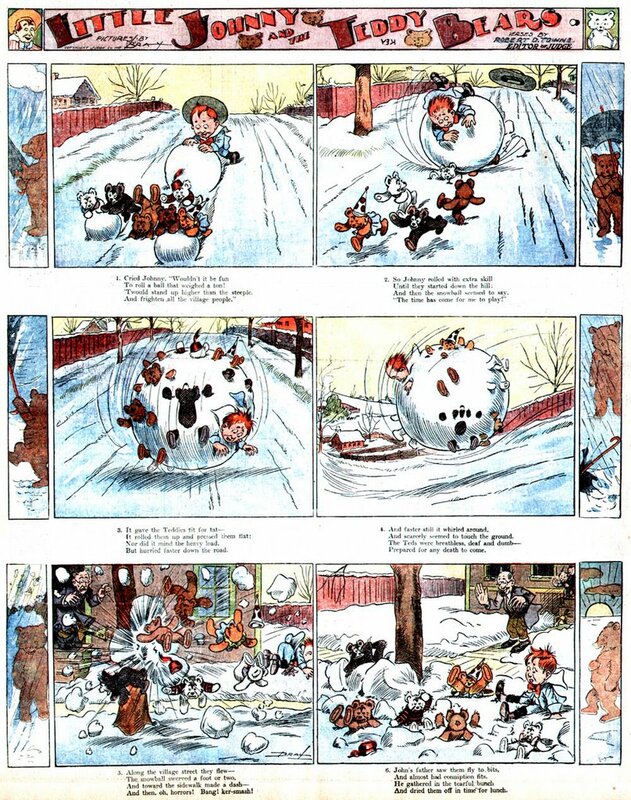 The Press added a whole litany of special features that year (including their own homegrown Sunday comics section), and Kessler found work doing weekly half-page cartoons to accompany the poetry of Frank M. O'Brien. This feature ran just six months. I lose track of Kessler now for a full six years, but I suspect he might have been doing editorial cartoons for the New York Globe and Advertiser for some portion of the time. In 1922, though, he first pokes his head onto the national stage with a new syndicated panel feature for the Metropolitan Newspaper Service. The panel is in the Briggs-Webster mode with no traditional title, rather a revolving set of titles keyed to the subject of the day. The titles are mostly standard issue, following closely on the models of his betters. Big Moments in Little Lives, Home Sweet Home, Making The Grade, Into Each Life Some Rain Must Fall, One Man In A Thousand, etc. His one title that breaks the mold is At The Bottom of the Ladder, wherein Kessler tells an anecdote from the lives of great men and women, usually from their childhood or early experiences, and accompanies the story with a suitable cartoon. These cartoons were collected in a massive reprint volume in 1926 by Lippincott. Kessler's panels were dropped by Metropolitan in 1925, but he took the feature over to the New York Evening Graphic, and they continued it until November 1926. Then he made another syndicate jump, this time to the bottom of the barrel Payne Syndicate, which syndicated the feature for awhile in 1927. The panels produced for Metropolitan, though, are resold to reprint syndicates who will hawk them to small papers for decades to come. 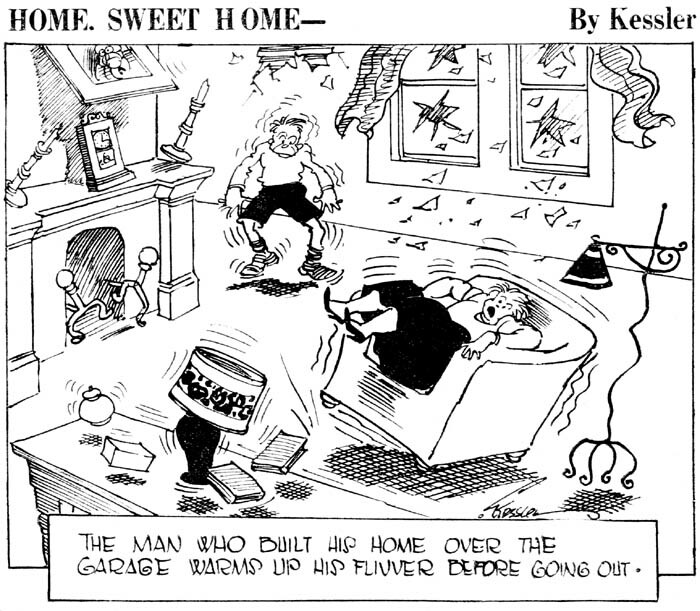 Kessler's back in the big time in 1928, now with a matrimonial strip titled In For Life for the New York World. The big time's call, though, is fleeting. The strip lasts for less than a month. Kessler next finds the Bell Syndicate willing to revive his panel cartoon, this time as a weekly feature. The new weekly run extends from 1930 to 1932. Bell has better success with a new Kessler daily panel titled Twenty Five Years Ago Today. This feature lasts at least through 1935, and possibly later. Once agin Kessler disappears for awhile. In 1939, though, the Consolidated News Service brings his panel back one last time. Here Kessler goes with a regular title, Seems Like Yesterday. Restless as always, though, the official title is changed to Home Town Echoes around 1942, and soon reverts to a revolving set of titles, bringing things full circle. I've only seen this panel running on a weekly basis, but it was advertised as a daily. The panel was advertised through 1950, but I've never seen any later than 1944. Kessler's artwork remained consistent throughout his career, workmanlike but with no stylistic flourish or panache. His gags are of the 'smile and nod' type, seldom if ever going for the big laugh. He was often grasping for the nostagic deja vu effects that were mastered by Briggs and Webster, but rarely succeeded as well as them. But if Kessler was a minor figure in cartooning lore, we have to give him his due - he was a working newspaper cartoonist for nearly fifty years, and how many can make that claim? I’ m Italian, I am very fond of comic strip and dream to become a scholar like you in this matter. I write some review about classic comic strips having a look on the Italian scene too. You can find them on www.lastriscia.net , a site where you may see some Italian comic strip from a group of authors I collaborate with.